Adjustable or Kinematic Mounts are used to provide alignment or positioning capability to optical systems. Adjustable or Kinematic Mounts are optical mounts that have been designed to feature a range of translation options. These optical mounts can be used in applications that require advanced positioning that is beyond what is provided by stationary optical mounts. 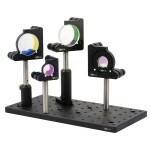 These mounts are ideal for use with a range of optical components, including optical lenses, optical filters, or optical mirrors.